Whey-X Protein Powder is the latest ultra-premium protein powder. Its a blend of whey protein , soy protein isolate (a high-quality source of slow-digesting protein ), the formula’s unique protein matrix delivers a mix of fast- and slow-release proteins that promotes a moderately-paced release of amino acids to fuel active muscles. * Drinking WHEY-X provides the fast-releasing benefits of whey and the prolonged amino acid release of soy for the ultimate post-workout recovery shake. And because it’s MAXENER the rich and satisfying taste is unmatched by any other protein supplement, despite having less fat and carbs With its relatively low calorie count and multi-functional blend of fast- and slow-release protein sources, WHEY-X is also perfect to use between meals or right before bed. If you’re looking for a premium protein supplement with an innovative, adaptable profile and unrivaled taste, look no further than MAXENER’S WHEY-X. 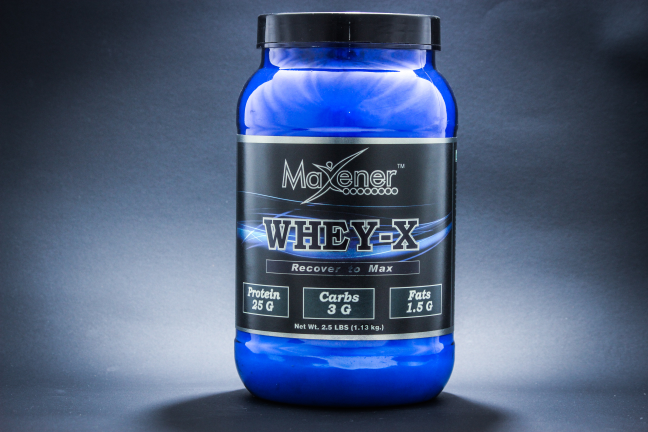 MAXENER brought its signature sense of innovation to the development of WHEY-X . Featuring a protein formula comprised entirely of whey and soy sources that delivers a moderately-paced release of amino acids, MAXENERS WHEY-X is designed to support: Muscle Growth and Enhancement Protein Synthesis Recovery Nutrition Weight Management.